IntelliSense has become an integral part in programming. It goes hand in hand with .NET because Visual Studio has ability to use reflection to retrieve all the information from the references that you have provided. If you start typing and IntelliSense has no suggestions you’ll immediately realize there is something wrong. Create a folder named “Scripts” in root. Note: This file must (by default) be located in a folder at the root called /scripts/. That's the naming convention. 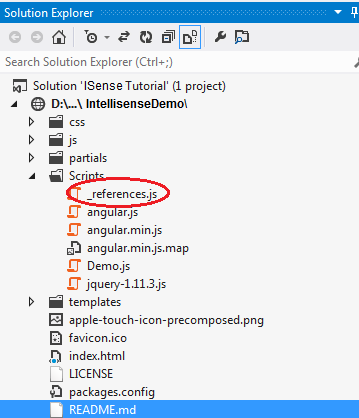 Any file located at /Scripts/_references.js is automatically added to global Intellisense. 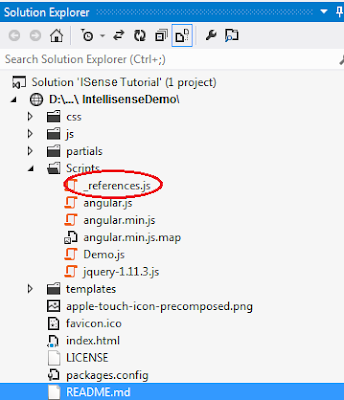 The file “_reference.js” will contain nothing but just a bunch of references. This is also the only file that is included in the intellisense all the time. Now you might be wondering what is first line. This new auto-sync comment is all it takes to enable automatic synchronization of triple-slash references. Whenever a .js file is added, renamed, moved or deleted, the _references.js file is automatically updated to reflect the changes. That’s it. Now just focus on logic to be implemented, intellisense will handle rest.